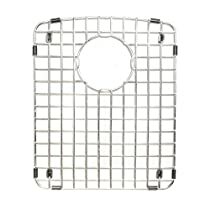 The FrankeUSA FBGG1114 grid protects your sink from scratches and stains. This grid fits into the bottom of sink and has an opening for the sink drain. Custom-fit for FrankeUSA sink model #DCH3322-1, #DGR3322-1, #DP3322-1, #EDCH33229-1, #EDDB33229-1, #EDOX33229-1, #DGR902KIT. A great fit, made of good materials, has buffered feet to hold the grid off of the bottom of the sink for sanitary reasons. Protects the granite composite sinks as advertised. Recommended. I bought this because it was specifically designed for the model of sink we had recently installed. It fits perfectly. Will it fit your sink? I couldn't tell you. Check with the sink manufacturer to see if they have one.